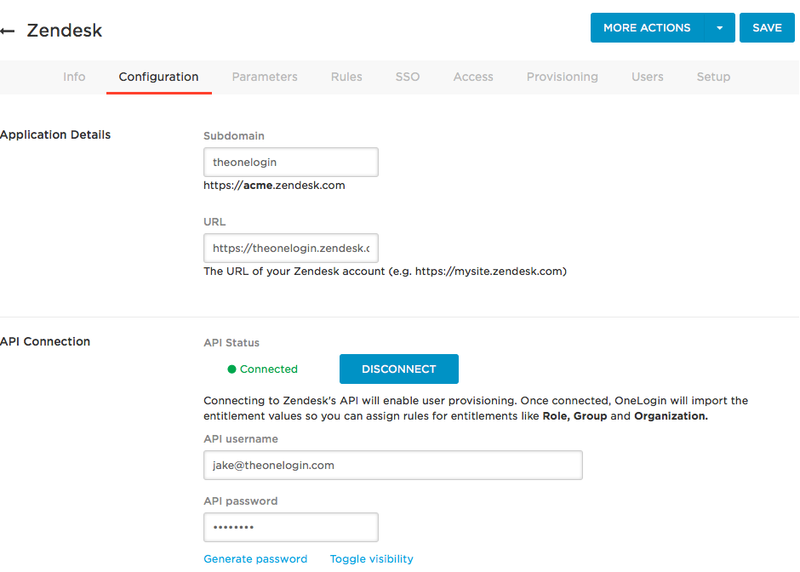 This article describes how to configure OneLogin to provision users to Zendesk. You perform the entire setup in OneLogin. (Optional) Turn off Zendesk welcome and password update notifications. If you leave these enabled, users will receive an email notification every time a provisioning update is made by OneLogin. To turn off welcome emails in Zendesk, go to Admin > Customers > User welcome email and clear the Also send a welcome e-mail when a new user is created by an agent or admin option. To turn off password update notifications in Zendesk, go to Settings > Security > Global and clear the User Email Notification option. Log into OneLogin as a Super User or Account Owner and go to Apps > Company Apps > Zendesk. Select Enable provisioning for Zendesk. For any action you select, a OneLogin administrator must go to Users > Provisioning and manually approve each action for provisioning to complete. Clear these options if you want OneLogin to provision new users and user updates to Zendesk without administrative approval. Select what happens to a user in Zendesk when that user is deleted from OneLogin. Select New Rule to bring up the New Mapping pane. 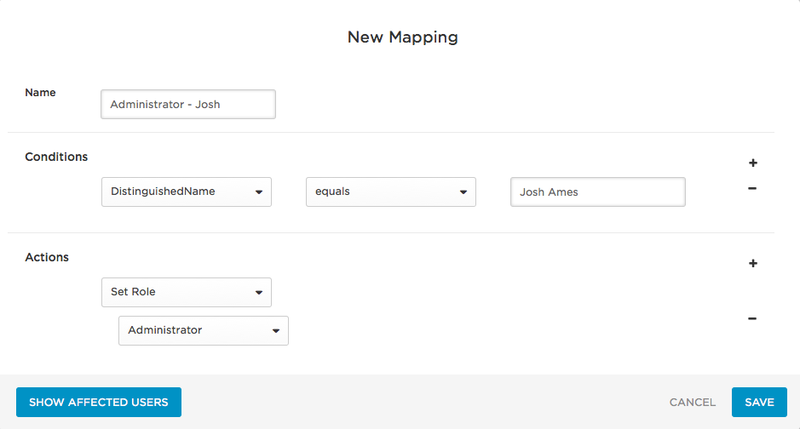 This example shows a user with the name of ‘Josh Ames’ being mapped to the Role of Administrator within Zendesk. Note: when the Conditions = DistinguishedName > equals > Josh Ames, Perform these actions = Set Roles >Administrator, it’s saying that ‘If provisioning encounters a User named Josh Ames, assign him into the Zendesk Role of ‘Administrator’. To confirm that provisioning from OneLogin to Zendesk is working, add a user to OneLogin and go to Users > Provisioning to approve the provisioning event, if necessary. When the user is marked as Provisioned, go to Zendesk and confirm that the new user has been added.